And that’s the story of how Deadpool used his resources wisely to save the day. The end. Oh wait, some stuff lead up to that, we should probably talk about some of that stuff since this issue is kind of a big deal. 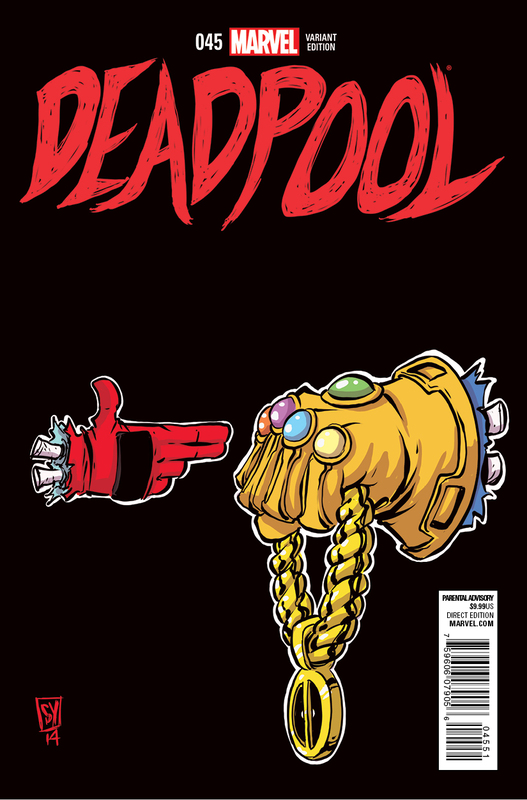 Writers Brian Posehn and Gerry Duggan take the time in this issue to give Deadpool one hell of a ride — and the body count is much larger than previous issues (for those of you keeping score out there). The army led by Flag Smasher (the new one) decides they should start small and work their way up to Ol’ Wade, which of course just gets him on edge even more, but Wilson isn’t the type to react irrationally… oh wait… okay this time he isn’t the type to act irrationally as he creates quite an impressive plan to get back at Flag Smasher and his men. The artists on the main part of this issue (there’s a whole other section, but we’ll get to that in a bit, so just be patient for a second) are artist Mike Hawthorne, inker Terry Pallot, and colorist Jordie Bellaire. A great moment comes in the scene I won’t talk about, but wooow, you’ll know what I’m talking about when you see it. Are you looking at it now? Crazy right? But another scene that is also great in this issue comes when Flag Smasher and his men try to attack Deadpool’s family (they’re like family, and his daughter is family). The scene kicks off with Ben Franklin bragging (as we all know he does… history class, am I right?) about how putting a Skeleton Army in the yard was such a good idea. Flag Smasher’s men (easier than saying U.L.T.I.M.A.T.U.M) are on the attack as the army rises up from the ground behind them. In this scene Hawthorne fills the house up with bullet holes and the glares of the army rising from the ground burn fear into the reader (tonight will be a night-light night). Bellaire ignites the top panel with the firing of the rifles giving off enough light to brighten the house, as the skeleton army comes from the shadows in the panel below. The second half of this issue (the reason you paid so much) depicts a wide array of writers and artists (Scott Aukerman wrote a story in here?!) as Deadpool makes even more memories! But he’s dead…or is he? No he’s dead… but is he really? He’s probably dead…. or is he?